The origin of Le Castella gets lost in the time. The presence of two or three islets not far from the dry land, confirmed until the sixteenth century, is still shrouded in mistery. According to Omero, the goddess Calipso would have lived there and would have also withheld Ulisse (the hero of the seas) for a long time. Although historians, literary men and geographers agree in placing the bewitched islet in the archipelago in front of Capo Cimiti, Capo Rizzuto e Punta Castella, the quarrel about its real geographical position has not been defined yet. In order to understand the true meaning of the noun “Le Castella”, in the plural and not in the singular, we must consider that the popular tradition tells us about the existence of many other castles situated on the islands facing the shoreline and sinked in the sea abysses. In the documents referring to the Norman-Swabian period, the name of the village was Castella Maris (Judex Castellorum Maris) and its inhabitants were called Castelisi. But the real story of the place is connected with the Castle, a building which was and is still today, the barycentre of all events of this wonderful "piece of Calabria". he geographical position of Punta Castella was due to the Friendship Treaty between Rome and Taranto in 304 a.c. It is a fact that on the basis of this Treaty, Roman ships weren’t allowed to navigate in the eastern part of Capo Licinio. 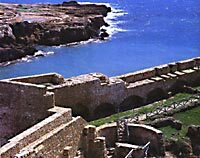 Tarantis set up a lookout post just at Le Castella, in order to sight the ships coming from the Tyrrehenian and going towards Taranto. After a century, in the late years of the Second Punic War, between 208 and 202 a.c. according to tradition, Annibal under the pressure of Roman Army obligedto a sudden homecoming, ordered the construction of a lookout tower just in the place where now there rises a powerful Aragonese monument. After Annibal’s departure, Romans made about three thousand colonists land for strategic reasons and called the place Castra. So the presence of those men gave origin to the village, which was named Castella..